The fall and winter months can be dangerous for the elderly. With the rainy season causing mud, puddles, and other situations which could cause your loved one to slip and fall, you should always be prepared for an emergency. Medical alert bracelets are a great way to stay safe in case of an accident – if your loved one experiences an emergency which causes an ambulance to be called, all of his or her medical information will be readily available for first responders to see. A medical alert bracelet is a fashionable and convenient way to display any important medical issues, such as allergies, blood type, medications you take, and other medical conditions as well as your name and emergency contact information. This can be a life-saving accessory; if your loved one slips while out for a stroll, the first responders will not only be notified of existing medical conditions, but they will also know how to get in contact with you. If your loved one does not want to wear a medical bracelet, there are medical alert necklaces and even keychains are available that can also be personalized to contain all of your family member’s medical conditions and contact information. Grandma or Grandpa may not like to wear medical bracelets, but it is a sure bet that they do not leave their house without their keys, so a keychain would be a convenient way to take their medical information along with them, too. Mud, puddles, wet leaves, slippery grass, and icy walkways can cause your loved one to slip and potentially hurt him or herself. Medical alert bracelets will give you peace of mind while allowing your loved ones to maintain their independence. 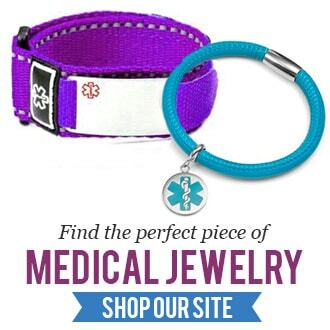 Visit StickyJ Medical ID’s site today for a broad range of medical ID’s for men and women in a variety of styles.